An organization designed to help senior citizens in the Crescenta Valley is holding an event next week to inform seniors about local discounts and services and in turn let it be known what the organization does. 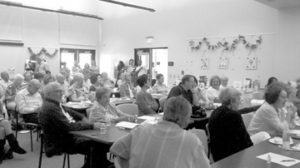 ASTER, which stands for Assisting Seniors Through Enhanced Resources, will be holding the first part of its speaker series on April 28 in the La Crescenta Library community room. The event will be from 4:30 p.m. to 6 p.m.
Presenters from the AARP, L.A. County and ASTER President Jeff Friedman will speak. “Ultimately what ASTER wants to be is we want to be a great resource for our seniors. So if they are looking for a service … our goal is to have a huge resource directory on the website for them,” said Robbyn Battles, vice president of the group. “What better to take care of our seniors then by giving them good information?” Battles said. Battles said they will try and have a speaker series every quarter of the year at the La Crescenta Library. Community member Steve Pierce has been able to get the approval of both the Montrose and CV Chambers of Commerce to join ASTER in its new “60+ Senior discounts,” which will be an ongoing project for the group. The event next week will offer information and will provide seniors with a loyalty card just like a Ralphs card. When the card is presented to participating retailers they will be get a senior discount. Basically, Battles said the group’s objective is to provide something significant for seniors, “if it’s transportation that they’re looking for, maybe some type of brick and mortar type place,” she said. She also noted that she is always looking for people who want to be a part of ASTER to help seniors, and that the group is continually looking for retailers to help out with the discount program. Battles said part of what made her help start ASTER about three years ago was that she couldn’t find enough information when her parents started getting sick. ASTER is out to change all of that in the foothills; it hopes to fully expand from Sunland-Tujunga to La Cañada-Flintridge. It may get there eventually, and it starts next Thursday.